Aldara Genital Wart Removal: Imiquimod 5 Cream & Pump Side Effects? Aldara cream and pump containing Imiquimod are common topical treatments for HPV genital wart removal. But do they really work without side effects? What are the alternative over the counter creams to help get rid of genital warts? What Is Imiquimod Wart Cream? Imiquimod is an immune response modifier which has been used by medical professionals and doctors to treat various kind of skin conditions, such as genital warts, superficial basal cell carcinoma (a type of skin cancer), and actinic keratosis (a kind of sun damage). Imiquimod is a topically active immune enhancer that help stimulates the human body immune system into fighting damage to the skin, such as genital warts and skin cancer cells. The Medical University of Graz in Austria revealed a clinical study on 45 genital warts patients, which concluded Imiquimod 5% cream has beneficial effect on genital warts, with Imiquimod provides effective and safe treatments for untreated anogenital warts. Aldara Wart Removal Cream vs Zyclara Pump: Difference? Aldara cream contains 5% Imiquimod as its active ingredient, while it also contains inactive ingredients such as sorbitan monosterate, polysorbate 60, glycerin, etc. This cream is used to treat external genital and perianal warts, with some people even use it to treat plantar wart. Do not use it to treat internal warts. >> Check out detailed product description of Aldara wart cream. Zyclara cream contains 3.75% Imiquimod as its active ingredient, while it also contains inactive ingredients such as polysorbate 60, sorbitan monosterate, glycerin, etc. Zyclara pump is basically the same as Aldara, with the difference is their respective Imiquimod concentration level. Step 1: Before taking this topical treatment, inform the doctor if you have any of these other conditions: Sunburn, weak immune system, or graft-versus-host disease. Step 2: Use exactly as prescribed by your doctor. Aldara for genital wart is commonly used 3 times a week, for no longer than 16 weeks. Step 3: Before applying the cream, wash your hands and wash the skin area to be treated. Step 4: Allow the skin to dry for at least 10 minutes before applying the cream. Step 5: Apply the ointment to the treatment area in a thin layer, and rub in the cream until it disappears. Step 6: Leave the cream on the wart(s) for 6 to 10 hours. Step 7: After 6 to 10 hours, wash the area where the cream was applied with mild soap and water. The brief video below illustrates step by step application instructions of this Imiquimod cream. 1. Use the cream as directed by your healthcare provider. Treatment with Aldara cream should continue until the HPV genital warts are completely gone, or up to 16 weeks. 2. Sexual contact should be avoided while the Aldara cream is on the skin. If you decide to have sexual relations, apply this Imiquimod cream after — not before — sexual activity. If you have already applied the cream, it should be washed off before sexual activity. You can buy Aldara online via UK-based EuroClinix, OnlineClinic, or HealthExpress. Note that Aldara is a prescription drug that is only available to buy with doctor’s prescription only. If you are looking to buy genital wart cream over the counter, a good option is Nevi-Skin Wart Removal Cream. With all natural herbal extract ingredients, Nevi Skin cream is formulated to treat genital warts, non-genital warts (such as verrucas on foot and warts on hand), skin tags, and skin mole. 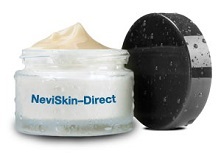 Nevi-Skin is available OTC without prescription required. According to clinical trials, about one-half of patients completely got rid of their warts by using Aldara cream. In most patients, the warts disappeared in 8 to 12 weeks, while some patients got rid of their warts in 4 weeks and others took up to 16 weeks. Aldara Cream Side Effects Review: Is It Safe? Skin irritation such as ulceration, itching, rash, swelling, or scabbing. Below are examples of actual Aldara side effects experience shared by users. Additionally, Australians talk about their devastating experiences with Aldara in video below. Aldara cream and pump containing Imiquimod that helps HPV genital wart removal by stimulating the human body immune system into fighting the warts on skin. While this Imiquimod topical treatment has proven success stories in getting rid of warts, medical experts and actual user experience have shown aldara cream side effects can include moderate to severe level of pain, burning, itching, ulcers, and fatigue. Note that Aldara is a drug that is only available to buy with doctor’s prescription only. For those who are looking for over the counter genital wart treatment, a good alternative is Nevi-Skin Wart Removal Cream with all natural ingredients. 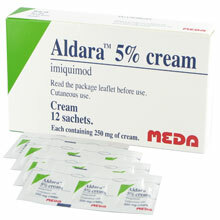 Aldara Imiquimod Cream Patients that prefer prescription drug. Amazon / EuroClinix / OnlineClinic / HealthExpress. ← Revitol Skin Tag Remover Reviews: Removal Cream That Work or..?